The use of synthetic amino acids in organic poultry diets is very controversial. Methionine is an essential sulfur-containing amino acid. Synthetic methionine is commonly added to conventional poultry diets, but is restricted in organic poultry diets. The protein requirement of animals is more accurately a requirement for the building blocks of protein known as amino acids. Once consumed, proteins are broken down into amino acids, and they are then absorbed by the animal to produce the specific proteins that they require. While all amino acids are important, some cannot be produced by animals and must therefore be supplied in the diet. The amino acids that cannot be produced by animals are referred to as essential amino acids. Methionine is one of the essential amino acids for poultry. Methionine is a sulfur-containing amino acid that is essential for healthy and productive poultry, and is important for many different functions in the body. By producing methyl groups, methionine is responsible for a variety of metabolic reactions. It is also essential for cell proliferation and development. There are two methionine requirements: one for maximal performance (i.e., maximum body weight gain or egg production), and a lower level needed for adequate but reduced growth or egg production while still raising a healthy, productive animal. A methionine deficiency typically leads to poor feed conversion, retarded growth in meat birds, and reduced egg production in layers and breeders. Methionine is required to provide the building blocks for immune cells and tissues. This includes the nonspecific mechanisms such as the skin and mucosa, and the specific mechanisms that include T and B lymphocytes. This is particularly important for newly hatched chicks that are highly susceptible to infection during the first two weeks of life. Methionine is a major component of feathers. Methionine and cysteine (another sulfur-containing amino acid that is not essential in the diet) are critical to feather formation. A deficiency of methionine results in poor feather growth and increased feather pecking. A methionine-deficient bird will tend to eat feathers in an attempt to obtain enough methionine. Feather pecking can quickly turn into cannibalistic behavior in a flock. The National Organic Program rules (United States Department of Agriculture [USDA], 2000) initially stated that synthetic methionine was a prohibited material for animal diets. An exemption was given to allow the industry to find alternatives. As research continued in this area, the National Organic Standards Board (NOSB) later recommended that, until October 1, 2012, the use of synthetic methionine be restricted— originally to 4 pounds per ton for laying hens, 5 pounds per ton for broiler chickens, and 6 pounds per ton for turkeys and all other poultry. After October 1, 2012, the allowed levels were decreased to 2 pounds per ton for laying and broiler chickens, and 3 pounds per ton for turkeys and all other poultry. Conventional poultry diets are typically corn and soybean meal based. Grains are typically low in lysine, and legumes (e.g., soybeans) are low in methionine. 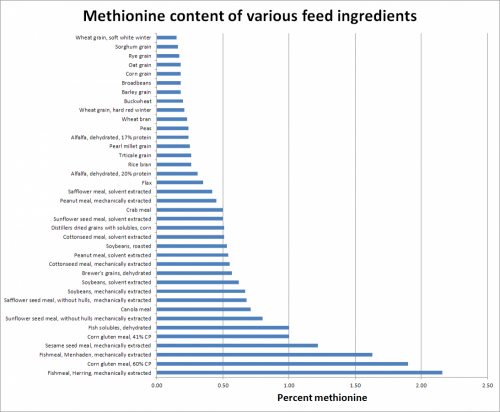 With this combination of feed ingredients, methionine is typically the first limiting amino acid. One way of meeting the methionine requirement is to feed excessive protein so that the daily intake of methionine is met. This results in an excess of nitrogen excretion and is not environmentally friendly. The use of synthetic methionine in poultry diets makes it possible to feed lower levels of dietary protein that still meet the daily methionine requirement. Amino acids can exist in two forms referred to as D- or L-isomers. Methionine in tissues typically occurs in the L-form. Although the D-form is not biologically active, poultry have the ability to utilize both D- and L- forms. Methionine supplementation is typically in the form of dry D,L-methionine which is 99% pure, or as liquid D,L-methionine hydroxy analog-free acid which is the equivalent of 88% methionine after the conversion of the analog to the biologically active form. It is important, however, not to focus entirely on methionine. In an effort to meet the methionine requirement, amino acid imbalances may occur. It is not just the level of methionine that is required but a balance of all the essential amino acids. Antagonisms have been shown to exist such as leucine-isoleucine-valine, arginine-lysine, and threonine-tryptophan. There is some research to indicate that meat-chickens in the grower and finisher phase can obtain sufficient methionine while foraging pastures (Moritz et al., 2005). This would include the plant material consumed as well as any insects they can catch. However, obtaining significant methionine from pasture depends highly on forage composition and management, as well as environmental conditions, and may be more useful for small flocks than for large-scale organic poultry production. The regulations for organic poultry production specify that poultry must have access to the outdoors, but they do not require that they have access to pasture. It may be very difficult to provide large poultry flocks with sufficient year-round access to quality pasture to meet their methionine requirement. The area of pasture recommended is 27 ft²/bird (8.23 m²/bird) (Mortiz et al., 2005). In addition, pasture quantity and quality differ significantly between seasons (Buchanan et al., 2007). Sesame hulls, a byproduct of sesame paste production, have been reported to be high in methionine (Farran et al., 2000). Its recommended use, however, is limited to 8% in broiler starter diets and 14% in layer diets. Organic sources of sesame hulls are currently not available in the United States. Sesame paste (also known as tahini) is widely used in cooking in many countries, and availability of the hulls may be higher in countries where it is produced. It is important to keep in mind that even animal protein and high-quality plant protein contain only about 2% methionine, whereas D,L-methionine is 99% methionine. Producers of commercial organic poultry are likely to lose yield when synthetic methionine is banned and this may result in price increases to the consumer. Another strategy that has been suggested is the use of slower-growing birds. While slow-growing meat chickens have less muscle than their fast-growing counterparts, research has shown that there are no differences in methionine requirements (Fanatico et al., 2009). The use of choice feeding has also been studied as a means to meet the methionine requirements but has not been shown to be effective (Rack et al., 2009). This may have been due to the choice of ingredients used in the study and not the feeding method. Agricultural Marketing Service—National Organic Program [Online]. United States Department of Agriculture. Available at: http://www.ams.usda.gov/nop/ (verified 07 August 2012). Buchanan, N. P., L. B. Kimbler, A. S. Parsons, G. E. Seidel, W. B. Bryan, E.E.D. Felton, and J. S. Moritz. 2007. The effects of nonstarch polysaccharide enzyme addition and dietary energy restriction on performance and carcass quality of organic broiler chickens. Journal of Applied Poultry Research 16:1–12. (Available online at: http://japr.fass.org/content/16/1/1.full (verified 23 April, 2013). Fanatico, A. C., C. M. Owens, and J. L. Emmert. 2009. Organic poultry production in the United States: Broilers. Journal of Applied Poultry Research 18:355–366. (Available online at: http://dx.doi.org/10.3382/japr.2008-00123 (verified 23 April, 2013). Farran, M. T., N. G. Uwayjan, A.M.A. Miski, N. M. Akhard, and V. M. Ashkarian. 2000. Performance of broilers and layers fed graded levels of sesame hull. Journal of Applied Poultry Research 9:453–459. (Available online at: http://japr.fass.org/content/9/4/453.abstract (verified 23 April, 2013). Moritz, J. S., A. S. Parsons, N. P. Buchanan, N. J. Baker, J. Jaczynski, O. J. Gekara and W. B. Bryan. 2005. Synthetic methionine and feed restriction effects on performance and meat quality of organically reared broiler chickens. Journal of Applied Poultry Research 14:521–535. (Available online at: http://japr.fass.org/content/14/3/521.short (verified 23 April, 2013). Rack, A. L., K.G.S. Lilly, K. R. Beaman, C. K. Gehring and J. S. Moritz. 2009. The effect of genotype, choice feeding, and season on organically reared broilers fed diets devoid of synthetic methionine. Journal of Applied Poultry Research 18:54–65. (Available online at: http://dx.doi.org/10.3382/japr.2008-00053 (verified 23 April, 2013).